The OMAF and MRA Field Crops team has recently completed a survey of the 2013 Ontario corn crop to determine ear mould incidence as well as the occurrence of mycotoxins in the grain. These mycotoxins, particularly vomitoxin (DON) produced primarily by Gibberella/Fusarium ear moulds can be disruptive when fed to livestock, especially hogs. A total of 197 samples were collected from September 30 to October 4, 2013 from corn fields across the province. In each field, 2 random areas were selected and in each area 10 consecutive ears were hand harvested and bagged. In fields with several hybrids, representative samples were taken again from two areas for each hybrid (maximum of 4 hybrids per field). The 20 ear samples were then immediately dried and shelled. The resultant sample was thoroughly mixed and a sub-sample was provided to SGS AgriFood Laboratories in Guelph for vomitoxin (DON) analysis. These results are very close to last year’s findings when 4% of the samples where over 2.0 PPM and stand in contrast to the 2011 survey when 23% of the samples registered 2.0 PPM DON or higher. Gibberella and Fusarium ear moulds and DON concentrations in the grain are minimal again this year. For the 2013 samples that had slightly elevated DON levels they did not appear to be concentrated in any particularly area of the province (see map below). The survey did point out that in an area or field where the DON concentrations appear to be very low on average; hybrid impacts can be significant, as side by side hybrids sometimes had significantly different DON levels. Growers and seed company personnel need to be vigilant in checking for ear mould or DON risks that might be hybrid related. Although the survey indicates that the 2013 Ontario corn crop is quite low in ear moulds and vomitoxin stakeholders are reminded that individual field conditions are important in ear mould and mycotoxin development. In fields where bird damage or Western Bean Cutworm feeding is significant additional attention should be paid as DON levels may be higher in those fields. Weather conditions may also result in further mould growth and DON increases since the time the samples were taken. 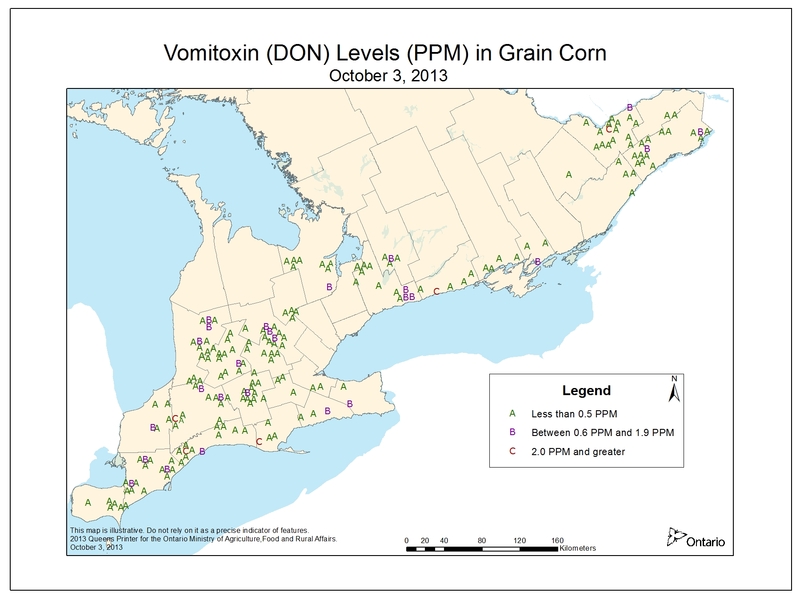 A map of southern Ontario depicting the levels of vomitoxin (DON, PPM) found in 197 grain corn samples collected from September 30 to October 4, 2013. Acknowledgements: Appreciation is extended to the Grain Farmers of Ontario and SGS AgriFood Laboratories for their support of this survey and analysis.